The theme of the notes is bridges of Denmark and ancient Danish artifacts found in the vicinity of the bridges. Danish artist Karin Birgitte Lund was selected to design the 2009 series after a competition. The competition specified the bridges theme as mandatory, and it was her idea to include the artifacts on the reverse side. 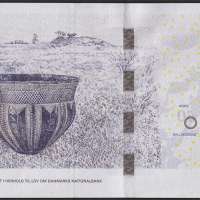 The sizes of the 2009 bank notes are identical to the 1997 bank notes, in order to avoid alterations to automated teller machines. The height is 72 millimetres and the lengths are from 125 mm to 165 mm, increasing by 10 mm for each new value. Features the Sallingsund Bridge of 1978 and the Skarpsalling Vessel (clay) dating from around 3200 BC. This denomination features the word "halvtreds" (halvtredsindstyve = half-third times 20 = half of the third times 20 = 2½ × 20 = fifty) instead of "femti" which was used on the previous series 50 DKK notes ("femti" (five 10s) was usually for reasons of convenience written on cheques). Front: Sallingsund Bridge between Nykøbing and Roslev, is 1717 metres long. Back: The Skarpsalling Vessel; Locations of Sallingsund and Skarp Salling marked on the map of northern Denmark. Designer: Artist Karin Birgitte Lund. Watermark: The watermark becomes visible when the banknote is held up to the light. The watermark shows a Viking Ship from Skuldelev in Roskilde Fiord, together with the denomination 50. Date of Issue: 11 August 2009. The clay vessel from Skarpsalling in Himmerland (Jutland), was found in a burial chamber in 1891. The vessel is one of the finest examples of pottery design and decoration known from Stone Age Denmark. It was created when the barrows were built in approximately 3200 BC, when pottery as a craft was at its peak. Clay vessels were used during the burial rituals – some pots with contents were stored in the barrows and others were put at the entrance to the chambers. The paper: The banknotes are printed on dirt-resistant cotton paper that is much stronger than normal writing paper. The paper is incorporated into the surface called Anti Soil Treatment. 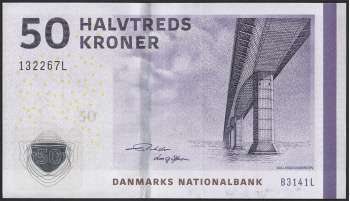 The paper is delivered to Danmarks Nationalbank's Banknote Printing Works complete with watermark and hidden security thread. Among the new security features is Crane’s windowed Motion thread on the back, which was first used by Sweden and is now incorporated in Mexico’s high-denomination notes. Another feature is a new, sophisticated hologram on the front that reflects light in different colors. The new banknotes will also have the traditional security features such as a watermark with electrotype 50, a solid security thread, and Omron rings. Banknote validity: All Danish banknotes issued after 1945 are still valid and will be exchanged at face value by Danmarks Nationalbank.